What Does Bill Gates Carry Around in His Wallet? Carol R. asks: How much money does Bill Gates carry around with him on a daily basis? We’d bet that the vast majority of people reading this, regardless of gender, race or socioeconomic background, carry the same few basic items with them at all times; a phone, some keys, a few dollars, a debit card, and maybe some I.D are all items you’d reliably expect to find if you asked an average person on the street to turn out their pockets. But what would you find if you asked a millionaire, or even a billionaire, to do the same thing? As it turns out, it would appear you’d find they’d produce more or less the same or less from their pockets as the average Joe. For example, Bill Gates rarely seems to carry cash at all, or at least rarely admits to doing so. Gates is frequently asked by both journalist and the people he meets how much money he carries around with him on a daily basis and in most every interview we found, Gates’ stock response is that he seldom carries either cash or a wallet with him. An exception to this was a preamble Gates did to an AMA (Ask Me Anything) on Reddit, where he pre-emptively answered some of the more popular questions he’s found himself being asked in the past, including “How much do you have in your wallet?”. The answer to which, at least at that moment in time, was a single, crisp $100 bill. It should be noted that the next question Gates answered was “Can I have a million dollars?”, which he tactfully answered by explaining he donates the bulk of his money to needy causes. This question, and Bill’s desire to answer it ahead of time, likely explains why he rarely carries cash, or at least doesn’t admit to doing so. After all, nobody can ask you for money if it’s well known you never carry any around. Gates is by no means an outlier and it’s an observable phenomenon that the ultra-wealthy rarely seem to feel the need to carry all that much cash (or even a wallet at all). Reasons vary from billionaire to billionaire, but the most common given we found is that they simply don’t need to. Billionaires are inevitably flanked at all times by an army of assistants and aides who can take care of things like restaurants bills and tips on their behalf, so the need to carry physical currency, credit cards, or even necessarily ID, is diminished somewhat. Possessing two or three of the right cards bound together by an ordinary rubber band now conveys a level of distinction greater than that of any cash-filled Louis Vuitton wallet or purse. The fact of that matter is that cards like the hyper-exclusive American Express Centurion card – which as we’ve mentioned in another article, can literally be used to buy anything that’s for sale, even if it costs hundreds of millions of dollars – convey more about a person’s wealth than even the crispest stack of hundred dollar bills. This isn’t to say Trump doesn’t sometimes carry cash. In keeping with his penchant for showmanship, Trump did formerly claim to carry around a few hundred dollars at any given time – or at least he did prior to becoming president. He stated this was mainly just in case he needed to hand out tips, rather than the money being used to buy something per se. Beyond money or a wallet, Trump also claimed he usually only carried around two cell phones (an iPhone and a Samsung), which we presume one was for personal use and the other a business phone. How much this has changed since becoming president isn’t clear. 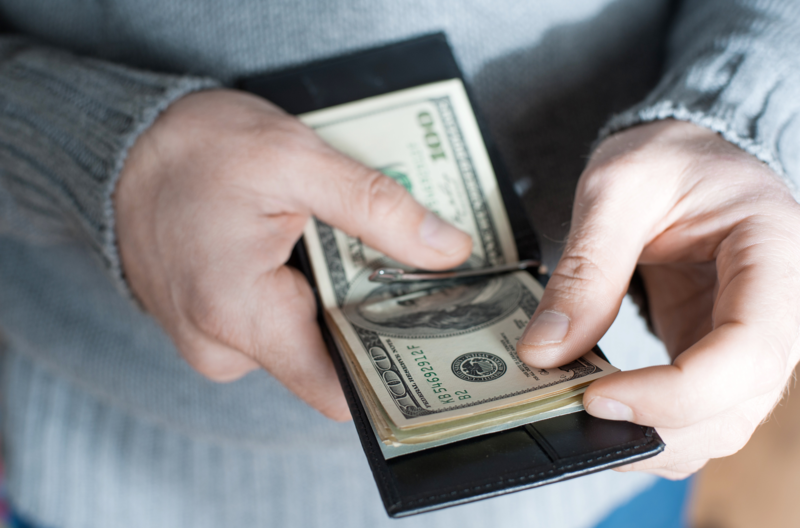 Continuing the trend, even before ubiquitous credit and debit cards, the likes of Howard Hughes, John Lennon and even Elvis, reportedly seldom felt the need to carry cash. In Elvis’ case, many of his trademark suits were even made without pockets. This segues into another thing previously alluded to that the obscenely rich seldom seem to carry- I.D. Although they likely do own passports and driving licenses, in interviews we trawled through in which the rich and famous were asked to turn out their pockets, few of them seem to bother carrying any form of identification on their person. The most likely reason why being, to paraphrase an obscure band this author likes, that their face is the ticket. Speaking of the Queen, although nobody but herself knows exactly what she carries around with her in her purse, we do know that she similarly never bothers to carry cash except on Sundays, when she traditionally carries a crisp £5 note to place in her church’s collection plate. Other items the Queen has been observed putting into or pulling out of her purse, handbag and pockets include lipstick, pens, napkins and on one occasion, a suction cup she attached to the underside of her table that she then hung her handbag on (which is kind of brilliant, actually). More unusual items the Queen is said to carry with her include personal knick-knacks, dog biscuits, and random mints she hands out to strangers. Going along with the theme that the richer you are, the less likely you are to have to pay for something, one of the more curious items carried by a billionaire we stumbled across was a special card carried by Warren Buffett that lets him have unlimited McDonald’s forever at certain McDonald’s. More specifically, as we’ve talked about before, this card is good for free food for life throughout Omaha McDonald’s and is one of a few items Buffett claims to carry on his person. Other items the famously spendthrift billionaire likes to carry include an original green American Express card from 1964, pictures of his family, and a lucky signed $50 bill from a bank his investment firm Berkshire Hathaway used to own. Curiously, Buffet is unique amongst billionaires we researched in that he’s the only one we found that admits to regularly carrying change. You see, Buffett nearly always eats breakfast at the McDonald’s near his house in Omaha on his way to work, and, curiously, despite literally having a card granting him unlimited McDonald’s for life and billions in the bank, says he pays for the breakfast with exact change. We assume he perhaps does this to avoid calling attention to himself or otherwise being delayed on his way to work by producing his free McDonald’s card. But, unfortunately for us, in the interview where he mentions carrying exact change for this purpose, the interviewer didn’t ask him why he doesn’t just use his free McDonald’s card. Another billionaire who kindly admitted to the monetary contents of his wallet in an interview is Elon Musk, who stated he only had about $40 in his wallet at the time. In conclusion, thanks to their fantastic wealth, the uber-rich paradoxically seem to have less need for carrying cash, credit cards, or even ID than us lowly mortals, whether because their army of assistants takes care of these sorts of things for them, or simply because they are less expected to pay for things when they go out. No Cash, but Does She Carry! TENDER TRENDS: RICH PEOPLE HATE CARRYING CASH! • The suction cup the Queen of England used for her purse is a variation on what some women use. It is alternatively called a purse hook or hanger. Here is an example: https://goo.gl/nEn4VD. • As the world moves more and more to digital identity and currency, all of us will experience the same thing the very wealthy do. God help us when the world gets to this point. No matter how “secure” the manufacturers tell you it is/will be, someone will find a way to hack it and then they can steal your identity that much easier, break into your house by literally walking in the front door or just steal your car without actually having to do anything beyond walking up to it and opening the door. Technology is beneficial, but it is also dangerous as people become more and more dependent on it. In very near future, everyone may be carrying a virtual wallet. Virtual currency has already been introduced through bitcoin. That will be a great futuristic thing.